The Club shall be known as The Midas Owners Club – hereafter referred to as ‘the Club’. Advise and Assist – on matters connected with Midas cars. Arrange – tours, lectures, discussions, social and other events and activities. Provide – Members with any other benefits and privileges possible. Eligibility – anyone in the UK or overseas, whether a Midas car owner or not. Categories – Honorary; Ordinary; and Family. 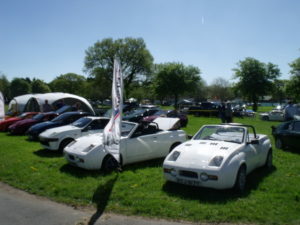 Honorary Members – may be elected by the Steering Group, normally in recognition of involvement in the design, development, manufacture or preservation of Midas cars, and/or their service to the Club and its Members. Family Membership – Applies to a maximum of two Ordinary Members sharing the same postal address. Attracts only a single membership subscription and an entitlement of up to two votes at the Annual General Meeting (AGM). A Membership Register shall be maintained listing the members of the Club. Resignation – by notifying the Membership Secretary. Removal – any member who has failed to pay his/her subscription (see “Non Payment ” below) may be taken off the Membership Register. Expulsion – where circumstances dictate and as decided by a majority vote at a Steering Group meeting. Steering Group members shall be given at least seven days’ notice of the meeting, and the member concerned shall be given seven days’ notice of such a meeting and given the opportunity to offer any explanation of the conduct concerned. Due – on the 1st of January each year, and covering the period from 1st January until 31st December of the same year. Subscription Rate – changes can only be agreed by a majority vote at an AGM. Non Payment – of the subscription within one month of the due date shall be notified to the member in writing by the Secretary. One month thereafter, any member who has still failed to pay his/her subscription may be taken off the Membership Register. No member whose subscription is in arrears shall be eligible to vote at any General Meeting or to take part in any activities organised by the club. Purpose – to represent the interests of members in achieving the objectives of the Club. Authority and Responsibility – for the business of the Club shall be vested in the Steering Group. A Steering Group shall decide and document the business of the Club by means of meetings (for which the participants need not be co-located). These meetings shall be held not more than two months apart. The Secretary shall give all Club members at least seven days’ written notice of Steering Group meetings, and issue an agenda in advance. Composition of the Steering Group shall be a minimum of six members, including the Club Officers. The Steering Group shall have the power to co-opt members as it deems necessary. A Quorum shall be formed by 4 members of the Steering Group including one Officer. Voting: each Steering Group member present at a meeting shall be entitled to vote. Non-Steering Group Members attending by invitation shall not be entitled to vote. Voting by confidential ballot shall be used if any Club member so requests.  To handle Club correspondence.  To provide a statement of accounts for Steering Group meetings, the AGM and as required by the Steering Group. The business of the Club may be broken down into a number of discrete roles, and shall be undertaken by its members. The list below is not exclusive, and the role titles are for guidance only. Membership Co-ordinator – to encourage and administer membership of the Club, including collection of subscriptions and payment to the Treasurer. News Co-ordinator – to provide and administer Club magazines and / or newsletters as agreed by the Steering Group and in a timely and cost effective manner. IT Co-ordinator – To control the administration of the Club Website and Club Forum. Regional Event Co-ordinators – To promote Club activities within local regional areas. Publicity Co-ordinator – To keep the public informed about Midas cars and the Club’s activities. Vehicle Registrar – To maintain a database of all Midas cars. Other roles may be added to this list as and when those activities arise. The nomination for the Steering Group of other members not holding any particular office or undertaking any particular role is welcome. Club Members not in the Steering Group may attend Steering Group meetings by invitation of the Secretary. Election of Officers shall be at an AGM. Club Officers will have to seek re-election at AGM. Any Club Officer can retire at an AGM, having given two months’ notice or at the AGM Chairman’s discretion. Nominations for candidates for election as an Officer should be submitted in writing to the Secretary, not less than seven days before the AGM. Exceptionally, nominations may be made at the AGM. The Steering Group may permit one Club Officer to perform any of the Club Officer duties (as an interim measure) subject to confirmation at the following AGM or Special General Meeting. Nominations for candidates for the Steering Group may be made at any time during the year, and confirmed by a simple majority at the next Steering Group meeting. No one individual is required to fulfil this role. It shall be undertaken by any participant by agreement of the Steering Group. Date & Time – An Annual General Meeting (AGM) shall be held within 14 months of the previous AGM, on a date and at a time proposed by the Steering Group, giving 28 days’ notice of the time and place to Club Members listed in the Membership Register at the time of giving that notice. Right to Participate – only the Steering Group and paid up Club Members may participate. (Note – in this context any honorary member will be deemed as having ‘paid’).  A review of resolutions from previous AGM. Any paid up Club Member may submit the text of any items for the agenda to the Secretary at least 14 days in advance. After the main Agenda, the opportunity shall be given for any Club Member to raise any matter concerning the Club. If necessary, a resolution relating to that matter may be put to the vote at the discretion of the AGM Chairman. Special General Meetings – May be convened by the direction of the Steering Group, or by written request to the Secretary bearing the signature of not less than ten Club Members. A Special General Meeting shall be held to decide dispersal of Club funds should closure become likely. If the meeting requested is not convened within twenty eight days, the said ten Club Members may convene such a meeting by advising all Club Members in writing of the time and place. Voting – All with a right to participate may exercise one vote each. The AGM Chairman shall not vote except in the exercise of a casting vote. At all General Meetings a simple majority of votes decides a resolution. Proxy Votes – may be made by a Club Member who shall in advance of the AGM provide written views on an issue to the Secretary. May only be made at a General Meeting and must appear in the agenda, which must be distributed 14 days in advance, with the proposer and seconder named. To amend the Constitution, a simple majority of votes cast is necessary, with 10% of Club Members constituting a quorum. The Club shall operate within a set of Financial Rules, which shall be written down and approved by the Steering Group. Approval authority for debit cards, cheques and electronic banking transfers and other means of administering Club funds. “In writing” shall be taken to include e-mail correspondence.